Metals undergo dynamic fracture under rapidly applied loads which are generally produced by impact or by explosive detonation. In comparison to quasi-static loading, dynamic conditions involve loading rates which are higher than those encountered in conventional tensile testing or fracture mechanics testing. Dynamic fracture includes two cases namely (i) a stationary crack subjected to a rapidly applied load, and (ii) a rapidly propagating crack under a quasi-stationary load. In both the cases the material at the crack tip is strained rapidly and, if rate sensitive, can offer less resistance to fracture than at quasi-static strain rates. As an example, values for dynamic fracture toughness are lower than those for static toughness as experienced in the testing of low carbon steels at different temperatures. Many structural components are subjected to high loading rates in service. They also are to survive high loading rates during accident conditions. This makes high strain rate fracture testing is of interest and components are to be designed against crack initiation under high loading rates or designed to arrest a rapidly running crack. Also, since dynamic fracture toughness is normally lower than static toughness, more conservative analysis requires consideration of dynamic toughness. Measurement and analysis of fracture behaviour under high loading rates is more complex than under quasi-static conditions. There are also several different test methods which are used in the evaluation of dynamic fracture resistance. Test methods based on fracture mechanics produce quantitative values of fracture toughness parameters which are useful in design. However, several qualitative methods are also been used in the evaluation of impact energy to break a notched bar, percent of cleavage area on fracture surfaces, or the temperature for nil ductility or crack arrest. These qualitative tests include methods such as the Charpy impact test, the Izod impact test, and the drop-weight tests. Other less common tests are the explosive bulge test, the Robertson test, the Esso test, and the tear test etc. Notched-bar impact tests were being performed on laboratory samples to simulate structural failures before fracture mechanics became a scientific discipline. This was done for eliminating the need to destructively test large engineering components. The simulation of structural component failure by notched bar impact tests is based on severe conditions of high loading rate, stress concentration, and tri-axial stress state. These tests have been extensively used in the evaluation of ductile-to-brittle transition temperature of low strength and medium strength ferritic steels used in structural applications such as ships, pressure vessels, tanks, pipelines, and bridges. The initial development of impact testing began around 1904 when Considére discovered and noted in a published article that increasing strain rate raises the temperature at which brittle fracture occurs. In 1905 another Frenchman, George Charpy, developed a pendulum-type impact testing equipment based on an idea by SB Russell. This testing equipment continues to be the most widely used equipment for the impact testing. In 1908 an Englishman by the name of Izod developed a similar test equipment which gained sizeable popularity for a period of time but then declined in popularity because of inherent difficulties in testing at temperatures other than room temperature. Impact testing was not widely used, and its significance not fully understood, until World War II when many all-welded ships were first built (around 3000 of them). Of these 3000 ships, about 1200 suffered hull fractures and 250 of which were considered hazardous. Actually, 19 or 20 of them broke completely in two. These failures did not necessarily occur under unusual conditions and several occurred while the ships were at anchor in calm waters. In addition to ship failures, other large, rigid structures, such as pipelines and storage tanks, failed in a similar manner. All failures had similar characteristics. They were sudden, had a brittle appearance, and occurred at stresses well below the yield strength (YS) of the material. It was noticed that these failures originated at notches or other areas of stress concentration, such as sharp corners and weld defects. These failures were often of considerable magnitude. It was noticed that frequently, but not always, failures occurred at low temperatures. Detailed historical studies have also brought out similar failures had been recorded since the 1800s but had not been given necessary importance. Further investigations have revealed that materials undergo a transition from ductile behaviour to brittle behaviour as the temperature is lowered. In the presence of a stress concentrator such as a notch, it takes little loading to initiate a fracture below this transition temperature, and even less to cause such a fracture to propagate. These transitions were not predictable by such tests as hardness testing, tensile testing, or the chemical analysis, which were common tests of the periods. It was then discovered that a ductile-to-brittle transition temperature could be determined by impact testing using test samples of uniform configuration and standardized notches. Such samples were tested at a series of decreasing temperatures, and the energy absorbed in producing the fracture was noted. The Charpy pendulum impact testing equipment was used. At first, test results were difficult to reproduce. The problem was partly resolved by producing more uniformly accurate test equipment. The notch very often used was of a keyhole type created by drilling a small hole and then cutting through the test bar to the hole by sawing or abrasive cutting. It was soon found that by using samples with sharper notches, better defined transition temperatures which were more reproducible could be determined. A well-defined notch with a V configuration became the standard. Steels in particular could then be tested and the ductile-to-brittle transition temperature obtained. Two problems remained still to be solved. First, testing equipments had to be standardized very carefully or the results were not reproducible from one of the equipment to other equipment. The other problem was that the transition temperature found by testing small bars was not necessarily the same as that for full-size parts. Luckily, the problem with standardization was resolved. It was noticed that impact testing was a necessity for producing successful armor plate and gun tubes and this had resulted in the development of standard test samples of various impact levels. This led to the standardization of the testing equipments. Then the manufacturers of testing equipment were forced into making equipment available which could meet these exacting standards. The problem of differing transition temperatures for full-size parts and test samples was discovered when a series of full-size parts was tested using a giant pendulum-type impact testing equipment and these results were compared with those determined using small standard test bars made from the same material. A partial solution to this problem was the development of the drop-weight test (DWT) and the drop-weight tear test (DWTT). These tests produced transition temperatures similar to those found when testing full-size parts. However, such tests are adaptable only for plate samples of limited sizes and have not become widely used. The Charpy V-notch test continues to be the most used and accepted impact test. However, the restricted applicability of the Charpy V-notch impact test has been recognized for many years. Charpy test results are not directly applicable for designs, and the observed ductile-to-brittle transition depends on specimen size. Nonetheless, the Charpy V-notch test is useful in determining the temperature range of ductile-to-brittle transition. Notch toughness is measured generally in terms of the absorbed impact energy needed to cause fracturing of the sample. The change in potential energy of the impacting head (from before impact to after fracture) is determined with a calibrated dial that measures the total energy absorbed in breaking the sample. Other quantitative parameters, such as fracture appearance (percent fibrous fracture) and degree of ductility / deformation (lateral expansion or notch root contraction), are also frequently measured in addition to the fracture energy. Impact tests can also be instrumented to obtain load data as a function of time during the fracture event. In its simplest form, instrumented impact testing involves the placement of a strain gauge on the tup (the striker). Many types of impact tests have been used to evaluate the notch toughness of metals, plastics, and ceramics. The types of impact tests can be generally classified in terms of loading method (pendulum stroke or drop weight loading) and the type of notched sample (e.g., Charpy V-notch, Charpy U-notch, or Izod). The following descriptions briefly describe the key types of impact tests which are normally used in the evaluation of steels or structural alloys. The Charpy and Izod impact tests are both pendulum-type, single-blow impact tests. The principal difference, aside from sample and notch dimensions, is in the configuration of the test setup (Fig 1). The Charpy test involves three-point loading, where the test piece is supported at both ends as a simple beam. In contrast, the Izod test piece is set up as a cantilever beam with the falling pendulum striking the specimen above the notch. The Charpy V-notch test continues to be the most utilized and accepted impact test in use. It is referred in many standards. While this test does not reveal exact ductile-to-brittle transition temperatures for large full-size parts, it is easily adaptable as an acceptability standard on whether or not parts are apt to behave in a brittle manner in the temperature range in which they are likely to be used. The drop-weight test is conducted by subjecting a series (usually four to eight) of samples to a single impact load at a sequence of selected temperatures to determine the maximum temperature at which a sample breaks. The impact load is provided by a guided, free-falling weight with energy of 340 J (joules) to 1630 J depending on the YS of the steel to be tested. The samples are prevented by a stop from deflecting less than a centimeter. This is a ?go, no-go? test method in which the sample either breaks or fails to break. It is surprisingly reproducible. The drop-weight tear test (DWTT) uses a test sample which resembles a large Charpy test sample. The test sample is 76 mm wide by 305 mm long, supported on a 254 mm span. The thickness of the sample is the full thickness of the material being tested. The samples are broken by either a falling weight or a pendulum machine. The notch in the sample is pressed to a depth of 5 mm with a sharp tool-steel chisel having an angle of 45 degrees. The resulting notch root radius is around 0.025 mm. One result of the test is the determination of the fracture appearance transition curve. The ?average? percent shear area of the broken samples is determined for the fracture area neglecting a region of ?one thickness? in length from the root of the notch and ?one thickness? from the opposite side of the sample. These regions are ignored since it is thought that the pressing of the notch introduces a region of plastically deformed material which is not representative of the base material. Similarly the opposite side of the sample is plastically deformed by the hammer tup during impact. The fracture appearance plotted versus temperature defines an abrupt transition in fracture appearance. This transition has been shown to correlate with the transition in fracture propagation behaviour in cylindrical pressure vessels and piping. The Charpy impact test is being used extensively to test a wide variety of materials. Because of the simplicity of the Charpy test and the existence of a large database, attempts also have been made to modify the sample, loading arrangement, and instrumentation to extract quantitative fracture mechanics information from the Charpy test. The specimen in the Charpy impact test is supported on both ends and is broken by a single blow from a pendulum which strikes the middle of the sample on the un-notched side. The sample breaks at the notch, the two halves fly away, and the pendulum passes between the two parts of the anvil. The height of fall minus the height of rise gives the amount of energy absorption involved in deforming and breaking the sample. Frictional and other losses amounting to 1.5 J to 3 J are added to it. The testing equipment is calibrated to record directly the energy absorbed by the test sample. Methods for Charpy testing of steels are specified in several standards. These standards provide requirements of test samples, anvil supports and striker dimensions and tolerances, the pendulum action of the test equipment, the actual testing procedure and equipment verification, and the determination of fracture appearance and lateral expansion. The general configuration of the Charpy test, as shown in Fig 2 for a V-notch sample is common to the requirements of most standards for the Charpy test. Differences in different standards include differences in machining tolerances, dimensions of the striker tip or tup, and the requirements for testing of reference sample. The most prominent difference between standards is the different geometry for tup of the striker. The tup in some of the standards is slightly flatter than in given in the other standards. From a comparison of results from Charpy tests with the two different tup geometries, differences appeared more pronounced for several steels at impact energies above 100 J. 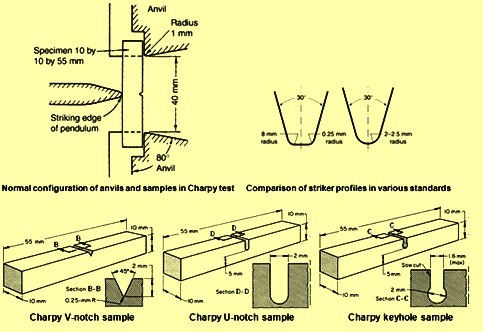 There are three basic types of standard Charpy samples (Fig 2) namely (i) Charpy V-notch, (ii) Charpy U-notch, and (iii) Charpy keyhole sample. The specifications of these samples are provided in various standards. Other Charpy type samples are not used as extensively as the V-notch sample since their degree of constraint and tri-axiality is considerably less than the V-notch sample. The Charpy V-notch impact test has limitations due to its blunt notch, small size, and total energy measurement (i.e. no separation of initiation and propagation of components of energy). However, this test is used widely since it is inexpensive and simple to perform. Hence, the Charpy V-notch test is normally used as a screening test in procurement and quality assurance for assessing different heats of the same type of steel. Also, correlation with actual fracture toughness data is often devised for a class of steels so that fracture mechanics analyses can be applied directly. Historically, extensive correlation with service performance has indicated its usefulness. The keyhole and U-notches were early recognized (1945) as giving inadequate transition temperatures because of notch bluntness. Even the V-notch does not necessarily produce a transition temperature that duplicates that of a full size part. Under current testing procedures, the Charpy V-notch test is reproducible and produces close approximations of transition temperatures found in full size parts. It is widely used in specifications to ensure that materials are not likely to initiate or propagate fractures at specific temperature levels when subjected to impact loads. Charpy testing needs good calibration methods. Equipment belting is to be inspected regularly for looseness, and broken samples are to be inspected for unusual side markings. Anvils are also need to be inspected for wear. Charpy impact testing equipments are available in a variety of types. Some are single purpose equipment for testing Charpy samples only. Others are adaptable to testing Izod and tension impact samples also. They are offered in a range of loading capacities. Some equipment has variable load capabilities, but most are of a single fixed load type. In the testing equipment, the available loading is to be such that samples to be tested break with a single blow, within 80 degree of the equipment capacity (as shown by the scale on the machine). While loading capacity depends on the anticipated strength of samples to be tested, the maximum value of such samples is the principal consideration. Very tough samples can stop the hammer abruptly without breaking. A number of such load applications have been known to cause breakage of the pendulum arm. On the other hand, lower capacity equipments are more accurate and more likely to meet standardization requirements. Charpy impact testing equipments are of pendulum type. They are to be very rigid in construction to withstand the repeated hammering effect of breaking samples without affecting the operation of the pendulum mechanism. The pendulum is to swing freely with a minimum of friction. Any restriction in movement of the pendulum increases the energy required to fracture the sample. This produces a test value which is higher than normal. There are always small effects of this type, and they are usually compensated for, along with windage friction effects, by scale-reading adjustments built into the equipment. While the pendulum is to be loose enough to swing freely with little friction, it is not to be loose so much so as to produce inaccuracies, such as non-uniform striking of the sample. The components are to be sturdy enough to resist deformation at impact. This is mainly true of the anvil and pendulum. It is important that the equipment to be in level. Some equipment has a built-in bubble-type level indicator. Others have machined surfaces where a level indicator can be used. In operation, the pendulum is raised to the proper height and held by a cocking mechanism which can be released instantly. Some standards specify that tests are to be made at velocities between 3 meters / second to 6 meters / second and that this is defined as ?the maximum tangential velocity of the striking member at the centre of the strike?. When hanging freely, the striking tup of the pendulum is to be within 2.5 mm of touching the area of the sample where first contact is to be made. The anvil that retains the test sample is to be made such that the sample can be squarely seated. The notch is to be centered so that the pendulum tup hits directly behind it. Many of the impact testing equipments have scales which read directly in joules (scales can also read in degrees). The scale can be adjusted to compensate for windage, pendulum friction, and other variations. The scale also reads zero when the pendulum is released without a sample being present. Pendulum and anvil design, configuration, and dimensions are important. It is also important that the broken samples be able to fly freely without being trapped in the anvil by the pendulum. Proper anvil design can minimize jamming. There are three normally used standard Charpy impact test samples, which are similar except for the notch. The V-notch bar is the most frequently used sample, although some specific industries still use the other types of test bars. As an example, steel foundries more often use the keyhole notch samples. There are also many types of sub-size samples which are to be used only when there is insufficient material available for a full-size sample, or when the shape of the material does not allow removal of a standard sample. It is important that samples are machined carefully and that all dimensional tolerances are followed. Care need to be taken to ensure that samples are square. It is easy to grind opposite sides parallel, but this does not ensure squareness. The machining of the notch is the most critical factor. The designated shape and size of the notch is to be strictly followed, and the notch is to have a smooth (not polished) finish. Special notch broaching machine tools are available for V-notching. A milling machine with a fly cutter can also be used. In preparing keyhole-notch samples, the hole is to be drilled at a low speed to avoid heat generation and work hardening. A jig is to be used with a drill bushing for ensuring accuracy. After the hole has been drilled, slotting can be done by almost any method which meets specifications, but care is to be taken to prevent the slotting tool from striking the back of the hole. In all cases, it is desirable to examine the notch at some magnification. A stereoscopic microscope or optical comparator is suitable for this examination. In fact, a V-notch template along with the optical comparator can be used to ensure proper dimensions. Samples need to be provided usually with identification markings. This is best done on the ends of the sample. In preparing samples where structural orientation is a factor (e.g., rolling direction of wrought materials), such orientation is to be taken into consideration and noted, because orientation can cause wide variations in test results. If not otherwise noted, the samples are to be oriented in the rolling direction of the plate (forming direction of any formed part) and the notch is to be perpendicular to that surface (orientation. This produces maximum impact values. All notching are required to be done after any heat treatment which might be performed. Once the equipment has been properly set up and calibrated and the samples have been correctly prepared, testing can be done. Prior to each testing session, the pendulum is to be allowed at least one free fall with no test sample present, to confirm that zero energy is indicated. Samples identification and measurements are then recorded along with testing temperature. The pendulum is cocked, and the sample is carefully positioned in the anvil using special tongs which ensure centering of the notch. The quick-release mechanism is actuated, and the pendulum falls and strikes the sample, normally causing it to break. The amount of energy absorbed is recorded (normally in joules), and this data is noted adjacent to the sample identification on the data sheet. The broken samples are retained for additional evaluation of the fracture appearance and for measurement of lateral expansion where required. The broken halves are often placed side by side, taped together, and labeled for identification. The release mechanism is to be consistent and smooth. Testing samples are to leave the impact equipment freely, without jamming or rebounding into the pendulum. The requirements on clearances and containment shrouds are specific to individual types of the test equipment. The testing samples are to be accurately positioned on the anvil support within 5 seconds of removal from the heating (or cooling) medium with the requirements for heating time depends on the heating medium. Identification marks on test samples is not to interfere with the test and any heat treatment of the samples, if needed, is to be done prior to final machining. Sample temperature can considerably affect the results of impact testing. If not otherwise stated, impact testing is to be done at temperatures at 30 deg C to 35 deg C. Charpy impact testing is also done at temperatures lower than those usually designated as room temperature. Of these low-temperature tests, the majority are made between room temperature and ? 50 deg C, since it is within this range that most ductile-to-brittle transition temperatures occur. A certain amount of testing is also done down to -200 deg C for those materials that may be used in cryogenic service. For testing at temperatures down to or slightly below 60 deg C, ethyl alcohol and dry ice are generally used. A suitable insulated container is used to cool the test samples. A calibrated temperature-measuring device, such as a low-temperature glass or metal thermometer or a thermocouple device is to be placed so as to read the temperature near the centre of a group of samples being cooled. The solution is to be agitated sufficiently to ensure uniformity of bath temperature. Results of impact testing are determined by three methods. In the first method, they can be read directly from the testing equipment (in joules). This is the most commonly specified test result. It is desirable to test three samples at each test temperature and the average value of the three is to be taken as the test result. If a minimum test value is specified for material acceptance, not more than one test result of the three is to be below the specified value. If the value of one of the three samples is around 6 J lower than the average, or lower than the average value by greater than of the specified acceptance value, the material is to be either rejected or retested. During the retesting, three additional samples are to be tested, and all are to equal or exceed the specified acceptance value. Since it is important to determine the ductile-to-brittle transition temperature, impact test results are plotted against test temperature. Somewhere in that transition zone between the high energy and low energy values is an energy value which can be defined as the transition temperature. When the transition is very pronounced, this value is easily determined. However, because the more common case is a less sharply defined transition, an energy value can be specified below which the material is considered to be brittle (below the ductile-to-brittle transition temperature). Such a value can vary with material type and requirements, but the value of 20 J is frequently used as a specified value. Other methods of specifying ductile-to-brittle transition temperature are sometimes presented along with the energy values obtained. The first of these auxiliary tests is the fracture appearance method. The fractured impact bars are examined and the fractures compared with a series of standard fractures or overlays of such fractures. By this method the percentage of shear fracture is determined. Unlike Charpy energy, fracture appearance is indicative of how a sample failed. It is therefore useful when attempting to correlate results of Charpy testing with other toughness test methods which use different sample geometries and loading rates. However, the fracture-appearance method can also be subjective. The other auxiliary method of determining transition temperature is the lateral expansion method. This procedure is based on the fact that protruding shear lips are produced (perpendicular to the notch) on both sides of each broken sample. The greater is the ductility, the larger is the protrusions. This lateral expansion can be expressed as a measure of acceptable ductility at a given test temperature. The broken halves from each end of each sample are measured. The higher values from each side are added together, and this total is the lateral-expansion value. A minimum value of lateral expansion is to be specified as a transition value. These test results are then plotted against test temperature and a curve interpolated. The impact energy in joules is also reported. Test criteria for Charpy V-notch impact testing usually involve (i) a minimum impact energy value, (ii) shear appearance of fractured test bars expressed in percent, and (iii) lateral expansion. For steels, the minimum acceptable values generally specified for these three evaluation methods are 20 J, 50 % shear, and 1.3 mm respectively. As a general rule of thumb, Charpy V-notch impact strengths of 14 J and lower are likely to initiate fractures. Impact strength of 27 J is likely to propagate brittle fracture once initiated, and values more than 27 J are necessary to arrest fracturing once it has been initiated. Charpy impact testing does not produce numbers that can be used for design purposes, but is widely used in specifications. The use of additional instrumentation (typically an instrumented tup) allows a standard Charpy impact testing equipment to monitor the analog load-time response of Charpy V-notch sample deformation and fracturing. The primary advantage of instrumenting the Charpy test is the additional information obtained while maintaining low cost, small samples, and simple operation. The normal used approach is the application of strain gauges to the striker to sense the load-time behaviour of the test sample. In some cases, gauges are placed on the sample as well. Instrumentation of the tup provides valuable data in terms of the load-time and the history during impact. Extensive efforts have been made to help determine the dynamic fracture toughness over a range of behaviour in linear-elastic, elastic-plastic, and fully plastic regions. Instrumentation allows the various stages in the fracture process to be identified. The energy value is associated with the area under the load-time curve up to maximum load. This impulse value is converted to energy by using Newton’s second law, which accounts for the pendulum velocity decrease during the deformation-fracture process. The ability to separate the total absorbed energy into components greatly augments the information gained by instrumentation. Load temperature diagrams can be constructed to illustrate the various fracture process stages indicative of the fracture mode transition from brittle to ductile behaviour. One of the primary reasons for the development of the instrumented Charpy test was to apply existing notch bend theories (slow bend) to the dynamic three-point bend Charpy impact test. Obtaining load information during the standard Charpy V-notch impact test establishes a relationship between metallurgical fracture parameters and the transition temperature approach for assessing fracture behaviour. Initial studies concentrated on the full range of mechanical behaviour from fully elastic in the lower Charpy shelf region to elastic-plastic in the transition region to fully plastic in the upper shelf region. Many studies have been performed on structural steels, with primary emphasis on the effect of composition, strain rate, and radiation on the notch bend properties. Interest in instrumented impact testing has expanded to include testing of different types of samples (e.g., pre-cracked, large bend), variations in test techniques (e.g. low blow, full-size components), and testing of many different materials (e.g., plastics, composites, aerospace materials, ceramics). The many variations in testing methods are a motivation for standardized test methods, although standardization for instrumented Charpy testing has been slow. Instrumentation for a typical Charpy impact testing system includes an instrumented striker, a dynamic transducer amplifier, a signal-recording and display system, and a velocity-measuring device. The instrumented striker is the dynamic load cell, which is securely attached to the falling weight assembly. The striker has cemented strain gauges to sense the compression loading of the tup while it is in contact with the test sample. The dynamic transducer amplifier provides direct-current power to the strain gauges and typically amplifies the strain gauge output after passing through a selectable upper-frequency cutoff. The impact signal is recorded and stored either on a storage oscilloscope or through the use of a transient signal recorder. Digital data from a transient recorder can be reconverted back to analog form and plotted on an x-y recorder, or the digital data can be transferred to a computer for direct analysis. Triggering is best accomplished through an internal trigger that has the ability to capture the signal preceding the trigger. External triggering from the velocity-sensing device is sometimes used instead of an appropriate internal trigger. The velocity-measuring system is usually a non-contacting, optical system that clocks a flag on the impacting mass immediately before impact so that initial velocity measurements can be made. Velocities are to be determined for all impact drop heights used. The impact testing equipment and the instrumentation package are calibrated to ensure reliable data. Instrumented impact tests that generate P-t plots from instrumented tups require careful attention to test procedures and analytical methods in order to determine dynamic fracture toughness values with the accuracy and reliability required for engineering purposes. Extensive efforts have been made to standardize instrumented impact tests, but many inherent difficulties in analysis and interpretation have impeded the formal development of standard methods. Nonetheless, instrumented impact testing is an accepted method in the evaluation of irradiation embrittlement of nuclear pressure vessel steels. Extensive efforts in the development of instrumented Charpy tests began in the 1960s and 1970s with the advent of fracture mechanics and pre-cracked Charpy V-notch samples, when the role of instrumented impact testing in the evaluation of dynamic fracture toughness was examined. The International Institute of Welding first attempted to standardize the instrumented Charpy test, but concluded that the test was not sufficiently documented, and the effort was discontinued. A few years later, two significant events prompted serious consideration of standardization. The load signal obtained from an instrumented striker during an impact test oscillates about the actual load required to deform the sample. Hence, the signal analysis procedure employed is to minimize the deviation of the apparent load from the actual sample deformation load. A simplistic view of the impact event allows three major areas for test specification to be identified namely (i) initial loading, (ii) limited frequency response, and (iii) electronic curve fitting. Since Charpy V-notch testing does not necessarily reveal the same transition temperature as that observed for full-size parts, many other tests have been devised. Two such tests have achieved some degree of popularity. These are the drop-weight test (DWT) and the drop-weight tear test (DWTT). Both of these tests yield a transition temperature which concides more nearly with that of full-size parts. This has been described as the nil-ductility temperature (NDT). Both the tests have limited usage because of the required sample sizes. There are three types of DWT samples. The smallest of these measures 16 mm × 51 mm × 127 mm, and thus, when four to eight samples are required, a considerable amount of material is needed. Often parts are not of sufficient size or are not shaped in such a manner to allow preparation of such samples. A provision is made for re-melting and casting material to sample size. Most DWT tests are made on plate which is 9.5 mm thick or thicker. The DWTT is also a plate testing specification. This test requires a sample 76 mm × 305 mm by full plate size. In the DWT test the crack inducer is a bead of hard-facing metal around 76 mm long. The sample, 89 mm × 356 mm × 19 mm, is placed weld down, on rounded end supports and is struck by a 27 kg falling weight with sufficient energy to bend the sample to around 5 degree. A cleavage crack forms in the bead as soon as incipient yield occurs (at around 3 degree deflection), thus forming the sharpest possible notch, a cleavage crack in the test sample. A series of samples is tested over a range of temperatures to find the nil-ductility transition temperature. The weld bead is deposited on one side of the sample at the centre using a copper template. The weld bead is purposely a hard, brittle deposit. A notch is made in the weld bead, but not in the sample itself. The sample, after being cooled to the desired temperature, is placed in the anvil with the notched weld deposit facing downward. The weight is dropped, striking the back side of the sample (the amounts of weight and height depend on the strength of the material being tested. The sample is allowed to deflect slightly under the impact load, controlled by deflection stops. This initiates a crack at the notch in the weld bead. When the crack reaches the sample material, it is either propagated or arrested. The sample is then examined to see whether or not it has fractured. A sample is considered to be broken if the crack extends to one or both sides of the sample surface with the weld bead. If the crack does not propagate to the edge it is considered a ?no break?. If the weld notch is not visibly cracked, or if complete deflection does not occur (determined by mark transfer on the deflection stops), it is considered a ?no test?. The nil-ductility transition temperature (NDTT) is the maximum temperature at which the sample breaks. When minimum temperatures are set in material specifications, at least two samples are to be tested at the specified temperature. All samples tested are to show a ?no-break? performance. The drop-weight tear test is similar in some ways to the drop weight test. The transition fracture appearance occurs at the same temperature as for full-size parts. It has the same sudden change from shear to cleavage as that observed in full-scale pieces of equipment. The test is relatively simple in terms of both sample preparation and lack of sensitivity to sample preparation methods. The results vary with sample thickness in the same manner as actual parts do. The principal short coming, as in the drop-weight test, is that testing is confined to plate material between 3 mm and 19 mm thick. The test sample is even larger than the DWT sample. It is 76 mm wide by 305 mm long. Tests are made with the same apparatus used for the drop-weight test, but the test fixture for holding the sample is totally different. A large pendulum-type test equipment can also be used, but the vertical weight-dropping apparatus is normally employed. Up to 2700 J of energy may be required. The holder for the test sample is to support the sample on edge (305 mm, or long edge) in such a manner that rotation does not occur when the sample is struck. This usually requires adjustable supports for differing sample thicknesses. Hardened supports at each end suspend the sample, and a centering guide at one end centres the sample. A slot in the centre of the anvil allows downward clearance for the breaking of the sample. Test sample can be removed by sawing, shearing, or flame cutting. Certain tolerances in the sample dimensions are allowed. A notch is impressed at the centre of one of the 305 mm edges. This is accomplished by using a sharp tool-steel chisel which is hardened. The sharp edge is to have an angle of 45 degrees +/- 1 or 2 degrees. The depth of the notch is 0.5 mm +/- 0.05 mm. The combination of the sharpness of the notch (radius of around 0.013 mm) and the cold working which occurs as the result of impressing produces cleavage fractures under the notch. Samples are tested at various temperatures. They are brought to the desired temperature by immersing them in a cooled solution and holding for at least 15 minutes at the temperature. The bath is agitated, and if several samples are cooled together then they are to be separated by several sample thicknesses. Samples are to be broken within 10 seconds after they are removed from the bath. The cooled sample is inserted in the anvil so that the notch is directly beneath the point of load application, and the test load, which is to be only of sufficient magnitude to produce a fracture, is suddenly applied. If the sample buckles under the test load, the test is considered to be invalid. Otherwise, the sample fractures and separates as it moves into the slotted anvil without the two pieces being jammed against one another. The test is evaluated by examining the broken pieces. The idea is to determine the percentages of the fracture surface which show ductile shear and brittle cleavage. The two regions are very different in appearance, and the transition from one to the other is sudden. There are two methods of making this evaluation. One is for percentages of shear from 45 % to 100 %, and the other for percentages from 0 % to 45%. The acceptance criterion is percentage of shear at a specific temperature. The temperature at which 50 % shear occurs is sometimes considered the ductile-to-brittle transition temperature. Such tests have often been used for evaluation of line-pipe steel material for natural gas transmission pipe lines. The samples from the curved pipe are usually flattened prior to the testing. Izod impact testing uses a sample with a V-notch which is similar to the Charpy V-notch sample. The principal difference is that the sample is gripped at one end only, allowing the cantilevered end to be struck by the pendulum. An advantage of this method is that several notches can be made in a single sample and the ends broken off one at a time. The disadvantage which has caused it to lose the popularity is that the required time needed for clamping and method of clamping the sample in an anvil precludes low-temperature testing. Izod samples can also be round. All dimensional tolerances are +/- 0.05 mm unless otherwise specified. The clamping surfaces of the sample are flat and parallel within 0.025 mm. Finish on unmarked parts is 2 micro metre. Striker width is to be greater than that of the sample being tested. Many testing equipments can be used for both Charpy and Izod testing. The one point bend test uses a single edge cracked sample and the same testing arrangement as a conventional three point bend test, except that the end supports are removed. The sample holder used in a Charpy or Izod test is replaced by a simple frame which supports the sample, while allowing it to move freely in the horizontal plane. Depending on the design of the original pendulum and hammer, the impact testing equipment can require retrofitting with a new hammer and striker which do not interfere with the sample edges or the support frame. When the hammer strikes the sample, the centre portion of the sample is accelerated away from the hammer and the end portions of the sample lag behind because of inertia. This causes the sample to bend and to load the crack tip. The primary advantage of the one-point bend test is that the measured stress-intensity history incorporates dynamic effects completely. Hence, no limits need to be imposed on the impact velocity and the test duration to fracture. Use of the one point bend test currently is restricted to small-scale yielding conditions. In the dynamic notched round bar testing, the sample is a long cylindrical bar with a fatigue pre-crack. During the test, the sample is loaded in tension at one end by an impact of sufficiently large magnitude which the resulting stress pulse produces a fracture at the notch. In principle, therefore, the dynamic notched round bar test is more amenable to analysis than the Charpy test because the fracture process is completed before the stress pulse has sufficient time to be reflected from the farthest end of the bar. The Charpy test is a simple, low-cost test that rapidly detects changes in ductility. However, the Charpy test does have certain disadvantages for quantitative assessments. Fracture in the Charpy sample does not occur under plane-strain conditions. Furthermore, the state of stress at the fracture site is unknown and quite complex due to multiple pulse reflections from its various surfaces. For these reasons, it is difficult to interpret Charpy results in terms of elastic or elastic-plastic fracture toughness parameters, although, as previously described, instrumented impact testing of pre-cracked Charpy V-notch samples provide useful results for evaluations of dynamic fracture toughness. Dynamic notched round bar testing yields data from which a reliable value of the dynamic critical stress intensity factor can be calculated easily. Hence, results are immediately related on a quantitative basis to fracture mechanics parameters. However, the test setup is rather elaborate, and more material is required for each sample compared to Charpy testing. As a result, the method is not suitable for routine testing. It may be used, however, when a precise evaluation of the fracture initiation properties of a particular material is needed, perhaps as a function of temperature as well as of loading rate. In this test, measurements of the average stress across the fracture plane and of crack-opening displacement, both as functions of time, are easily obtained. Various methods can be used to measure crack-opening displacement, but the stress across the fracture plane is most easily determined by using electric resistance strain gauges applied to the surface of the bar downstream from the fracture site. Another example of using a notched round bar in evaluation of dynamic fracture toughness is the determination of the toughness of the reactor-grade steel over the temperature range from 3 deg C to 50 deg C by dynamic loading of notched round bar samples with axial pre-compression of the notch. The Schnadt sample has been used primarily in Europe for testing of the ship plate. In the Schnadt test, five test pieces are used with different notch radii, ranging from no notch to a severe notch made by pressing a sharp knife into the bottom of a milled groove. A hardened steel pin is inserted in a hole parallel to and behind the notch, replacing the material normally under compression in the Charpy or Izod tests. The specimen is broken by impact as a three-point-loaded beam.